Creation of Northamptonshire-based composer, acclaimed acoustic guitarist and singer Chris Brown, hazeyjane is the vehicle for the live musical expression of his own original songs and adaptive arrangements of celebrated pieces of poetry. Chris’ voice is often said to resemble that of David Sylvian and his ambient acoustic guitar style uses unusual tunings and spider capos to create exquisite guitar figures and motifs that give his songs distinctively airy, graceful and spacious qualities. The soundscape settings of his songs are enriched by the accompaniment provided by the signature singing sound of Kevin T Wards fretless bass and his use of harmonics, stopping and chords to add rhythmic expression, texture, and colour. 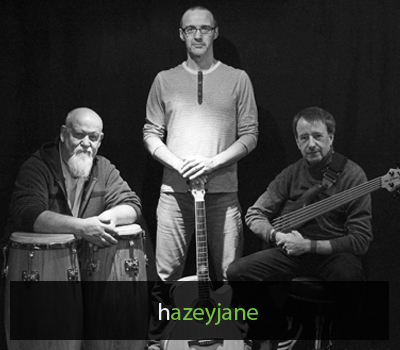 The hazeyjane line-up was bolstered recently by the addition of percussionist David ‘Hopi’ Hopkins and his myriad nuanced, percussive textures, which contribute greatly to the overall mood of the hazeyjane sound. Most rewarding to a listening and discerning audience, hazeyjane aim to produce mellow and melodic music that is, in turns, intense and intimate, dreamy and dynamic, relaxing in its mellifluence but hauntingly atmospheric; music that, ultimately, seeks the sublime. Chris plays Taylor, Maestro and Takamine acoustic guitars and Kevin uses Roscoe and Sandberg 5 string fretless bass guitars. Debut album release, ONE, was recorded and mastered at Tu-kay Records in Stoke Bruerne, and released July 2016 to a series of glowing reviews.